The following article is a guest post written by Cait Flanders, Managing Editor at RateHub.ca. RateHub.ca not only helps people compare the best Canadian mortgage rates, the site also features education centres built to address common questions from both first-time homebuyers and current homeowners. 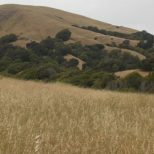 This post outlines their newest education centre. Do you know someone who has gone to refinance their mortgage to access equity, consolidate debt or transfer it, only to find they are then dinged with what seems like a massive penalty fee (otherwise known as a prepayment charge)? Maybe it’s even happened to you. Because it does, in fact, happen all the time. While the fees are somewhat standard across all lenders, little has been done to educate homeowners on what the fee is for and/or how it is calculated. On top of that, homeowners aren’t given enough information to explain whether or not paying this fee will actually save them in the long run (and if it will, by how much). Seeing this missing information as a window of opportunity, RateHub.ca has once again built an education centre dedicated with homeowners in mind. With information about why homeowners might refinance their mortgages, as well as a number of calculators to help people understand their options, RateHub.ca’s Refinance Centre is the most comprehensive package of information that Canadians can reference online when making a decision around refinancing. Whether you’re thinking of switching to a lower mortgage rate, consolidating your high interest debts into one payment with a smaller interest rate, or wanting to access equity, RateHub.ca’s Refinance Centre has a calculator that will help you make your decision. 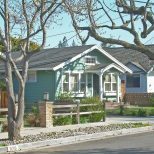 With a compilation of historical mortgage data, the calculators will give you well-informed estimates of the potential penalty involved with breaking your mortgage, which you can then compare to the savings that could come as a result. 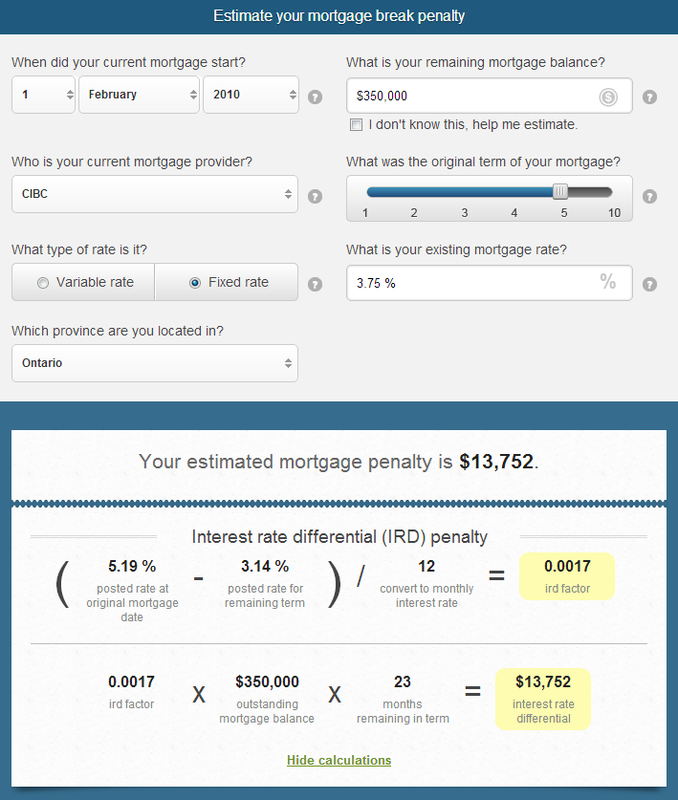 Want to see how the mortgage penalty calculator works? Click here to play around with some numbers yourself and/or look at the example screenshot. In this example, the homeowner has an outstanding balance of $350,000 on their 5-year fixed rate mortgage with CIBC. If this homeowner were to refinance today, it would cost them more than $13,000. 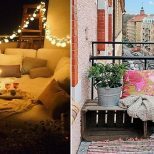 Depending on the reason behind wanting to refinance, and any potential savings that could come afterwards, it may or may not be worth it for this homeowner to refinance their mortgage. 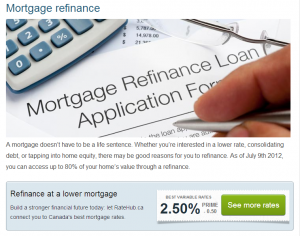 But how would they know, without the other calculators in RateHub.ca’s Refinance Centre? If you were to run the same numbers through CIBC’s prepayment calculator, you would likely get stuck on the part where it asks you to enter the rate discount you got at the time of your mortgage. At that point, you would need to call the bank to find out what your discount was. This seems like an unnecessary extra step for any homeowner, when the bank could simply populate the posted rate from the day the mortgage originated. See how RateHub.ca took that extra step out for you? Last March, the Canadian Bankers Association (CBA) released a new Code of Conduct, forcing lenders to provide crystal clear explanations of how prepayment charges were calculated, as well as include calculators on their websites that would help homeowners find reasonable estimates of what their penalties could look like. A year later, while most lenders seem to have calculators up, many still offer a terms and conditions style of writing to explain how the calculations are performed, leaving a number of homeowners in the dark. By showing exactly how RateHub.ca’s calculators come up with estimated penalties, homeowners can get a better of understanding of how much they might have to pay to refinance their mortgages and why.